Purchasing A Dual Fuel Generator for Your RV? 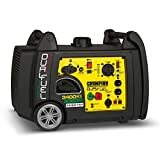 You are going to need a dual fuel generator to use the appliances in your RV when you don’t have access to “shore power.” It is very convenient to use and can charge anything from your mobile phone to the refrigerator. With so many generators available in the market today, it is easy to get confused while finding one for your RV home. Don’t worry though, because we have a detailed guide to help you out with just that. 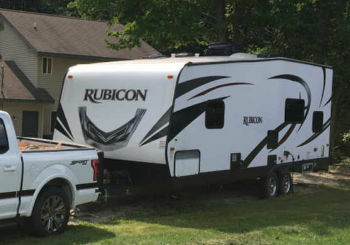 What size generator you need for your RV? The RV generator size depends upon the size of the air conditioner. If it uses 1500 – 2000 watts of power, a generator producing 3,000 watts is sufficient for your motorhome. If you aren’t too sure about the assumption, you can calculate the power each appliance in your RV needs. charging laptops and mobiles take another 300 watts. Add all these together and purchase a generator that produces at least that much power. You also need to consider its noise levels. You are going to running near where you will be at the campsite, so you have to find something that operates quietly. What style of generator do you want? Luckily, dual-fuel generators are quieter and usually more compact than standard portable generators. They are more expensive but also more reliable and there are two styles to choose from. One works like a lawn mowing machine where you have to pull the string or the other that needs a key. There are some that you can start using a remote, so you don’t even need to step out of the RV to switch it on. What are the things you need to keep in mind while purchasing a dual fuel generator? Your goal (and is mine) is to find a product that suits your needs the most. It should be able to provide additional power in case you need it to use more devices at once. Generators are heavy, but it shouldn’t be so heavy that you need an entire day to move it into your RV. You might want to take it out if you are planning to camp in the woods. Don’t settle for a cheap generator because you will be busy repairing half of your trip and not enjoy anything. Ask other RV homeowners for suggestions and brands that they prefer over others. As we mentioned earlier, calculate how much watts the different devices in your RV can consume. The generator you choose should run all devices at the same time. An ideal RV generator should have a runtime of at least 10 hours. When you fill up the tank in the night, it should go on until the morning without waking you up for a refill. A fuel level monitor indicates the amount of fuel inside the generator or its tank. It gives you enough time to buy more fuel if you need and manage the appliances you want to run with the remaining fuel. If you want a more reliable option, you can go for an inverter generator. It has a microprocessor-controlled circuit that ensures the smooth flow of power. The generator is lightweight and smaller in size, making it a more RV-friendly option. You can carry it around easily and delivers higher-quality electricity. Clean energy is the way to go. It is very durable as well, and since you will be traveling a lot, this is one quality that will come in handy. However, it has one big disadvantage, which is the cost. If you are planning to live in an RV forever, you might want to invest in something like an inverter generator because of you of its multiple benefits. On the other hand, a regular portable generator is enough for six months to a year use. 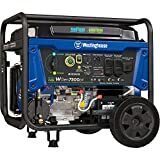 Westinghouse WGen 7500DF Dual Fuel Portable Generator works on both, gasoline and propane. It has an in-built 6.6-gallon gasoline tank, but you have to buy the propane tank separately. With gas, it produces peak wattage of 9,500 watts and rated wattage of 7,500 watts. The output is less with propane. It has a peak wattage of 8,550 watts and rated wattage of 6,750 watts. It has an electric push button and a key fob to start. You can choose to start the generator using any of the two methods. When fueled with gasoline, it has a runtime of 16 hours. The machine weighs 194 lbs and has a 420cc engine. You can drag it to your RV using the solid rubber wheels and handlebar. It has outlets to run your RV appliances. Other than that, it is EPA, CARB, and CSA compliant and comes with a residential manufacturer’s warranty of three years and a commercial warranty of six months. Fitted with a 439cc engine, Champion 7500-Watt Dual Fuel Portable Generator with Electric Start works on both gasoline and propane. It offers eight hours of runtime on gasoline and 5.5 hours of runtime on propane, making it a perfect choice for an overnight RV trip. The safety fuel selector switch automatically switches to another fuel when the one in use indicates a low level. It also comes with a low oil shut-off. The machines has an in-built 6 gallon gasoline tank and an inlet for propane. Purchase a propane tank separately and connect it with the inlet to use it as fuel. You can touch start the generator using the push-button electric start. The cast iron sleeve ensures durability and smooth operation of the product. Champion is one of the best generator companies in the market and are known for their reliability and excellent customer service. It comes with a three years manufacturer’s warranty and free lifetime call center technical support. You get a 270 warranty on parts and labor if you are using it commercially. Champion Support - 3 year limited warranty with FREE lifetime technical support. Refer instruction manual before use. Another product by Champion, the 3800-Watt Dual Fuel RV Ready Portable Generator with Electric Start is highly efficient and has a nine hours runtime on gasoline and 10.5 hours runtime on 20 lb of propane. If you have a small RV or motorhome, this is the generator you should go for. Powered by a 224cc Champion engine, the generator comes with a battery. It starts a single cylinder, which makes it easy to handle. The heavy duty wheels enable you to pull it easily without requiring too many people to do that. The generator is covered with a durable cast iron sleeve for superior protection from weather and damage. Other features that you will find in the machine include safety fuel selector switch, touch start, and gasoline fuel tank of 3.4 gallons. It only makes the noise of 68 dBA from a distance of 23 feet, which sounds like two people whispering. Champion gives three years residential warranty and 270 days commercial or industrial warranty on the dual fuel generator. 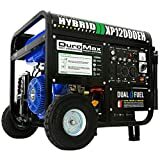 Heavy duty and durable product by DuroMax, the Hybrid Dual Fuel XP12000EH 12,000-Watt Portable Generator comes with a full power panel that indicates the oil warning light. It also comes with a voltmeter, power outlets, and a circuit breaker for easy functioning. It has a runtime of 10 hours on gasoline at 50 percent load and 20 hours on propane at the same load. 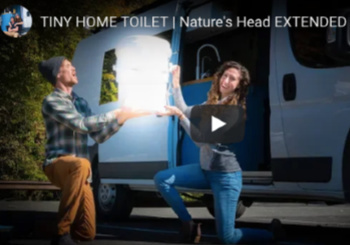 This product makes a convenient choice for full-time RV users and onlookers. The automatic low oil shut-off protects the battery from excessive load. It is fitted with a quiet muffler that reduces the engine sound and ensures a peaceful sleep in the night. The machine is often nicknamed as a beast and has a 457cc DuroMax OHV engine, which can power all essential appliances along with small gadgets like your laptops, tablets, and mobile phones. On purchasing the product, you will receive a 30 days replacement guarantee and one-year parts warranty. A compact model by Champion, 3400-Watt Dual Fuel RV Ready Portable Inverter Generator works on both gasoline and propane. The 3-position ignition switch ensures convenient switch on and off mechanism of the product. It has a touch panel that gives you access to different features including DC circuit breaker, neutral floating, and switch from propane to gasoline and vice versa among others. It only makes 59 dBA of noise from a distance of 23 feet, which makes it the perfect choice for RV and motorhome owners. It sounds like light whispers. The product has a runtime of 7.5 hours on gasoline, which is a bit inconvenient if you are up in the mountains and you have to get out in the cold to fuel up the tank. However, it produces clean energy for delicate and sophisticated gadgets like television, coffee machine, mobile phones, and tablets. You will get a three years residential warranty and 270 days commercial or residential warranty on the dual fuel generator. Champion also offers free lifetime technical support. This Dual Fuel Generator is our favorite out of the five. It has a nine hours runtime on gasoline and 10.5 hours runtime on 20 lb of propane. You can enjoy a peaceful night’s sleep if you feel it up before going to bed. The product comes with three years of manufacturer’s warranty. Even though it makes slightly higher noise, you can easily combat it using a muffler. 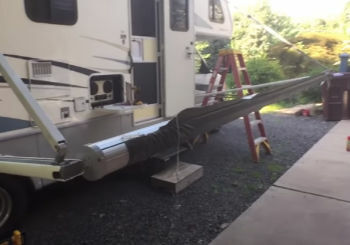 How To Replace An Awning On A Travel Trailer or RV?